Not far from our hotel on the Big Island of Hawaii is a beach called Anaehoomalu Bay. Its a beautiful sand beach that (as so rarely happens) includes world class snorkeling along with great swimming. And, being on the west coast, it also gets some great sunsets. 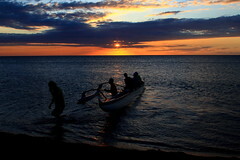 As we were relaxing on the beach enjoying the sunset these canoers came in from an afternoon of boating.